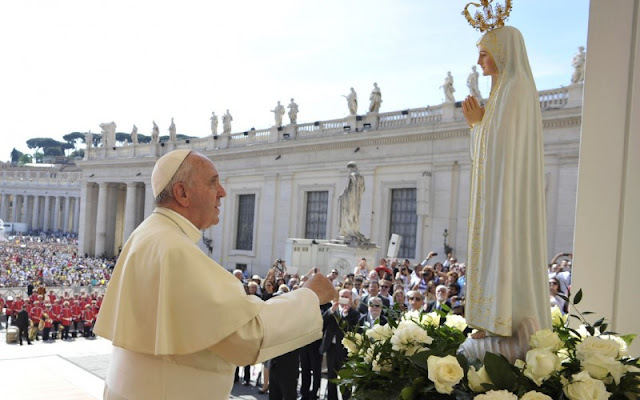 Pope Francis has instituted the ancient devotion to the Blessed Virgin Mary, under the title of Mother of the Church, a Memorial of the Roman Calendar. The liturgical celebration, B. Mariæ Virginis, Ecclesiæ Matris, will be held annually as a Memorial on the day after Pentecost. This was explained in a decree released on Saturday, March 3, 2018 by the Congregation for Divine Worship and the Discipline of the Sacraments, Cardinal Robert Sarah, its Prefect. He explained that the Pope’s decision took account of the tradition surrounding the devotion to Mary as Mother of the Church. The joyous veneration given to the Mother of God by the contemporary Church, in light of reflection on the mystery of Christ and on his nature, cannot ignore the figure of a woman (cf. Gal 4:4), the Virgin Mary, who is both the Mother of Christ and Mother of the Church. In some ways this was already present in the mind of the Church from the premonitory words of Saint Augustine and Saint Leo the Great. In fact the former says that Mary is the mother of the members of Christ, because with charity she cooperated in the rebirth of the faithful into the Church, while the latter says that the birth of the Head is also the birth of the body, thus indicating that Mary is at once Mother of Christ, the Son of God, and mother of the members of his Mystical Body, which is the Church. These considerations derive from the divine motherhood of Mary and from her intimate union in the work of the Redeemer, which culminated at the hour of the cross. Indeed, the Mother standing beneath the cross (cf. Jn 19:25), accepted her Son’s testament of love and welcomed all people in the person of the beloved disciple as sons and daughters to be reborn unto life eternal. She thus became the tender Mother of the Church which Christ begot on the cross handing on the Spirit. Christ, in turn, in the beloved disciple, chose all disciples as ministers of his love towards his Mother, entrusting her to them so that they might welcome her with filial affection. As a caring guide to the emerging Church Mary had already begun her mission in the Upper Room, praying with the Apostles while awaiting the coming of the Holy Spirit (cf. Acts 1:14). In this sense, in the course of the centuries, Christian piety has honoured Mary with various titles, in many ways equivalent, such as Mother of Disciples, of the Faithful, of Believers, of all those who are reborn in Christ; and also as “Mother of the Church” as is used in the texts of spiritual authors as well as in the Magisterium of Popes Benedict XIV and Leo XIII. Thus the foundation is clearly established by which Blessed Paul VI, on 21 November 1964, at the conclusion of the Third Session of the Second Vatican Council, declared the Blessed Virgin Mary as “Mother of the Church, that is to say of all Christian people, the faithful as well as the pastors, who call her the most loving Mother” and established that “the Mother of God should be further honoured and invoked by the entire Christian people by this tenderest of titles”. Therefore the Apostolic See on the occasion of the Holy Year of Reconciliation (1975), proposed a votive Mass in honour of Beata Maria Ecclesiæ Matre, which was subsequently inserted into the Roman Missal. The Holy See also granted the faculty to add the invocation of this title in the Litany of Loreto (1980) and published other formularies in the Collection of Masses of the Blessed Virgin Mary (1986). Some countries, dioceses and religious families who petitioned the Holy See were allowed to add this celebration to their particular calendars. This celebration will help us to remember that growth in the Christian life must be anchored to the Mystery of the Cross, to the oblation of Christ in the Eucharistic Banquet and to the Mother of the Redeemer and Mother of the Redeemed, the Virgin who makes her offering to God. The Memorial therefore is to appear in all Calendars and liturgical books for the celebration of Mass and of the Liturgy of the Hours. The relative liturgical texts are attached to this decree and their translations, prepared and approved by the Episcopal Conferences, will be published after confirmation by this Dicastery. Where the celebration of the Blessed Virgin Mary, Mother of the Church, is already celebrated on a day with a higher liturgical rank, approved according to the norm of particular law, in the future it may continue to be celebrated in the same way. From the Congregation of Divine Worship and the Discipline of the Sacraments, 11 February 2018, the memorial of the Blessed Virgin Mary of Lourdes.